Even though I was awake earlier than usual, I guess the little green men running through my mind wore my brain out and I was lazy getting out of bed. That and the fact that I was squished onto a bed since, heaven forbid, the dogs sleep on their blankets on the floor. 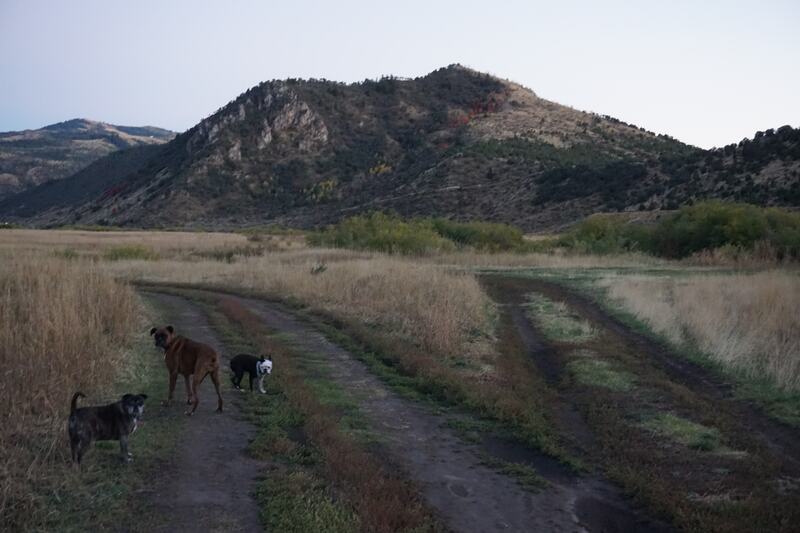 I took the dogs for another short walk before packing up. The restaurant had not opened yet and I handed my key to the staff sitting out front chatting before their day started. The road from Rachel was about the same that it had been on the way in minus the Joshua Trees. I’m still kicking myself for not going back for pictures. As I drove it gave me plenty of time to figure out my route. I had wanted to turn this into a real alien adventure and go to Devil’s Tower in Wyoming. But since I hadn’t had time to go to Roswell in New Mexico, it wouldn’t really be an alien tour anyway. And time was running out since I did have my grandparents to visit. If I’m going to stop at a park, I’m going to do it right and stay for at least a day so this time around I was going to bypass Devil’s Tower. 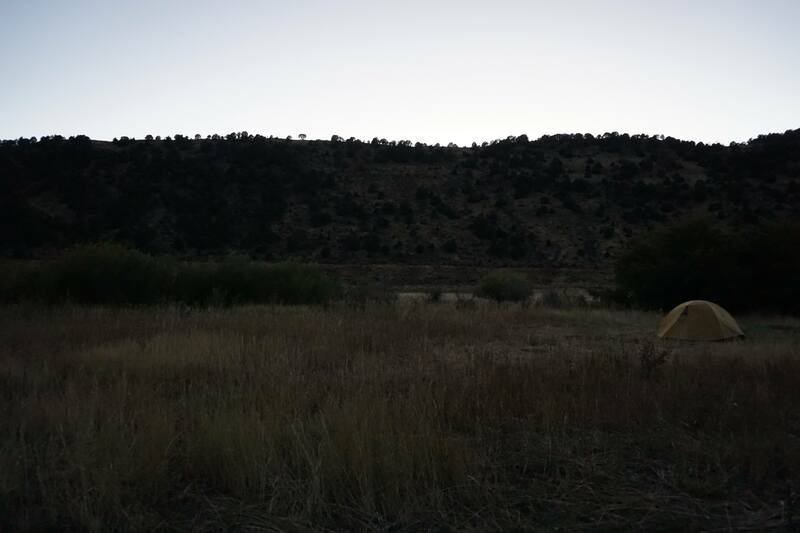 We were passing through Ely, Nevada when my tummy started protesting it’s empty state. We did a short tour along the main streets and I decided to stop at Silver State restaurant. 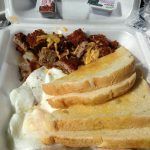 As usual, I asked for a recommendation and ordered the country fried steak with sawmill gravy, eggs, hash browns, and toast. Then I saw the display case of pies near the counter and was drawn to it like a moth to flame. I grilled the poor woman about them and she told me that she made all the pies. A fellow baker? Yay. I tried to ask about her about her preference for butter or lard and does she mix her flours? But the tables were filling up and that required more attention than me. 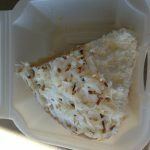 I collected my breakfast and a slice of coconut cream pie and hit the road. We found a small park near the restaurant and I dove headfirst into breakfast. I wasn’t quite sure what to expect as I had never had country fried steak or sawmill gravy. Well this Canadian girl is now a huge fan. I was dipping my toast into the gravy and pouring it over the hash browns. The dogs made sure that I shared the steak with them. The crunchy coating had a wonderful seasoning to it that I was peeling it off and eating it in chunks. Now get out of here or I shall taunt you a second time! Then we took a short walk around a duck pond next to the park as I tried to create room in my now full gut. While the dogs have all seen ducks and swans at home, usually the birds fly away. There was one swan that was standing on his side of the fence and he eyed Jack as he stood across from him. 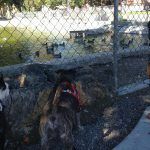 Even with Piper sidling up next to her older, shorter brother, that swan just stood there, puffed his chest up, shook his head as he flapped his wings, and I would have to say he strutted away as if to say “this here is my pond”. Unfortunately I wasn’t quick enough to record the standoff. And as a side note, aside from that one posturing swan, the ducks and swans did not seem to care much about the dogs at all. Had there been any panic or the dogs were going nuts, I would have moved them away. 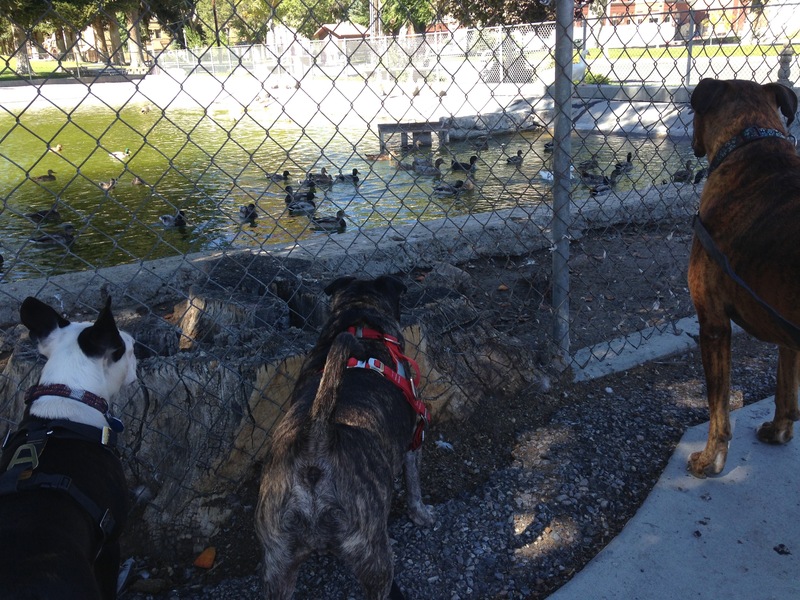 The dogs were curious and the ducks and swans were not. In fact, the dogs did not make a sound. Come to think of it, I don’t even think they pulled at their leashes. 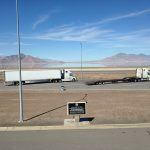 We continued through Nevada and stopped at the Bonneville Salt Flats. I expected to see… well salt flats. What I did see was a perfectly flat expanse of water stretching out from both sides of the highway. And a few tire tracks. I’m not sure if I would rather they be from people trying to avoid collisions or people thinking they could drive the flats. Both are kind of sad. So anyway, we took a walk around the rest area at the flats then sat at a table in a shady area so that I could eat my lunch: the slice of coconut cream pie from Silver State. I had the dogs water bowl out with a bottle of water and as I was reaching over the bottle to pick up my fork, my elbow spilled the whole litre of water onto my lap. The whole bottle. The family sitting at the table next to me pretended not see but I know they did. I tried squeezing as much of the water out my pants as I could, thankful that they were quick-drying then finished my pie. Let me tell you friends, sitting in a car with wet pants is unpleasant. Looking over the salt flats. I’m sure they’re out there somewhere. Then we continued on, back into Utah and then crossed into Idaho. Small confession here: when I think of Idaho, I think of potatoes. And for some reason when I think of potatoes I think of flat land. Well that is not Idaho at all. It is beautiful and the changing foliage was stunning. I was admiring the land as we passed through it, especially as it started getting late. I was looking for a place to camp but did not see anything close to the highway. 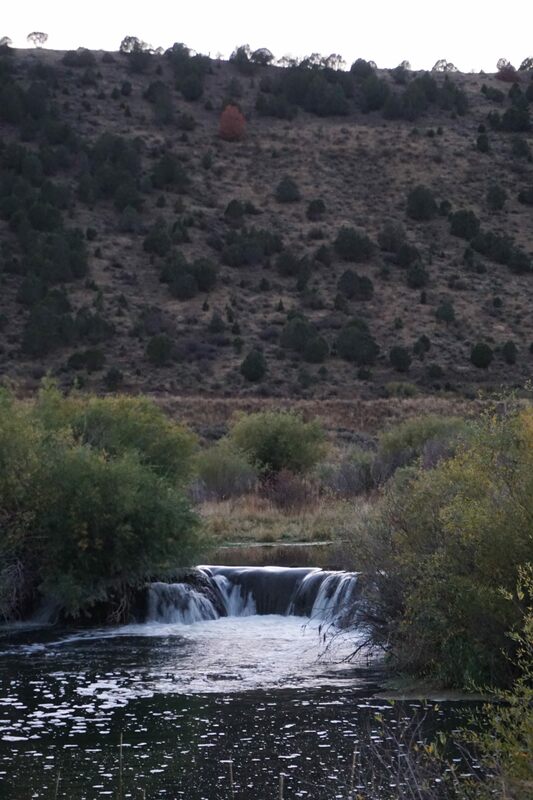 Finally I turned to Yelp and found a cluster at Lava Hot Springs so I headed there. I was a little unsure of the temperature so I considered getting a hotel room but when I looked at the prices, I felt my eyes bug out a bit. I guess it’s to be expected with it being something of a tourist spot but then when you add in dogs…well that price tends to go up a bit. I tried to do the fahrenheit to celsius conversion and with the weather calling for high 30’s to low 40’s I thought it should be okay. My limit is 10 degrees celsius so I thought that might be close. As I was trying to find the camping places that I had seen advertised, I saw signs for Bird Canyon State Park. I turned onto the road, a dirt track really, and saw that the only facilities were a shed for a toilet and a bulletin board which said this was Portneuf Lower. I was surprised to see that there were no permits required and no fees listed. Score! The sites were quite large with just a fire pit in a spot cleared in the grass. It was primitive camping to be sure but I had no problem with that at all. 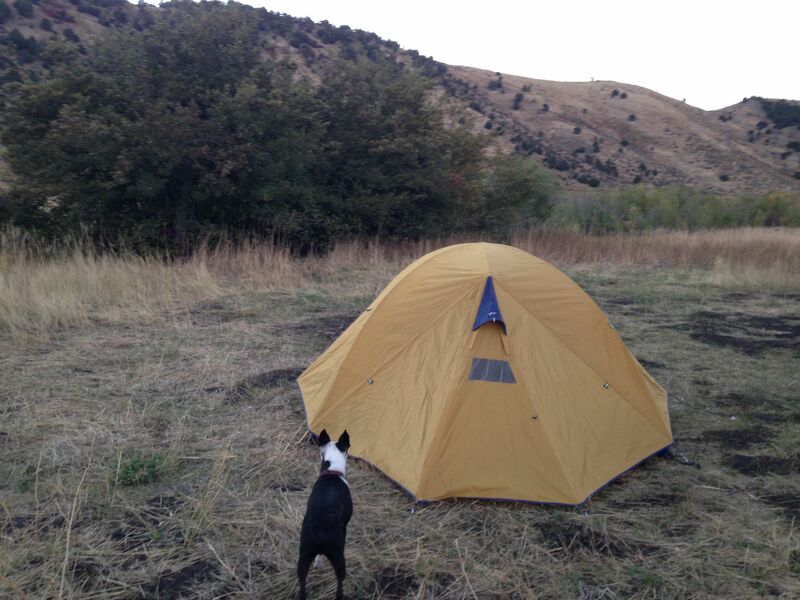 With only two other sites occupied, I picked a site far from them and was able to let the dogs run for a bit while I set the tent up. There was a train track running close by but I hadn’t seen a train go by and I figured that the trains wouldn’t run at night. More on that later. It was getting dark by the time I had everything set up and took them for a walk to explore a bit. I was finally a bit hungry so I dipped into my food stores and whipped up some ramen noodles with dehydrated mushrooms. It was such a tasty dinner to shovel down as I stood at the back of my car eating by the light of my headlamp. We climbed into the tent and almost immediately Leo squeezed into the foot of my sleeping bag. I was worried that they might be chilled so I tried pulling some of the free blankets over top of them. Jack immediately shook it off and went to his blanket that he balled up underneath himself. Piper just expects that she will always be sleeping next to me but she soon slipped out from under the blankets as well and tried to climb onto my sleeping bag which upset Leo and he wriggled out of the bag and to the far side of the tent. They shifted their places a few times during the night but each time I tried to throw a blanket over them, they would have none of it. Leo trying to figure out how to get in first. Heading back to our site. This little pond was just downstream of our site. 1 response to "Leaving Nevada"